There are times in a critic’s life when one can barely believe the good fortune of witnessing something so extraordinarily splendid on a stage. 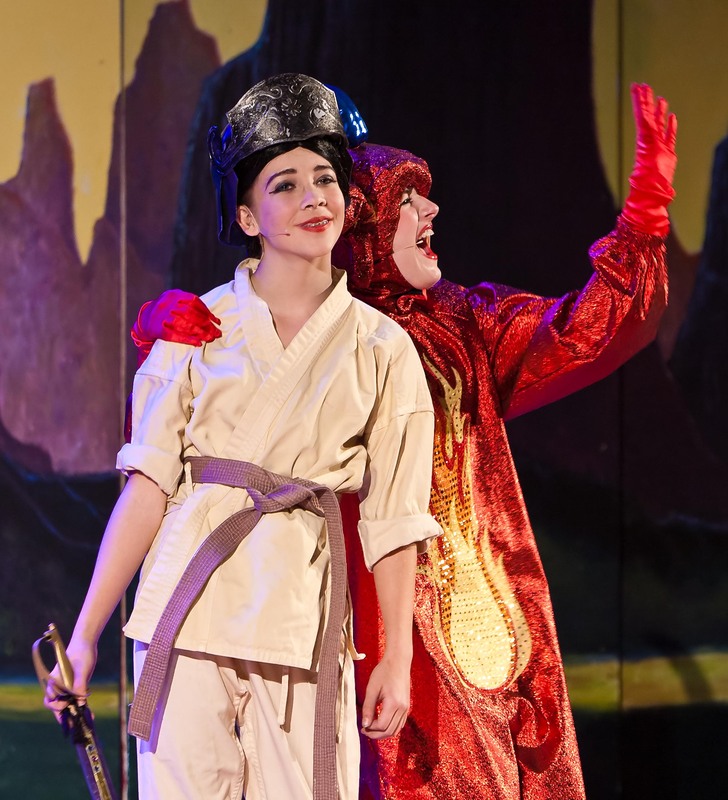 Last weekend’s Class Act Production of Disney’s MULAN was a case in point. If we were on Broadway we might chalk the experience up to yet another great Broadway show. But this was not Broadway; it was the Center For The Arts Theatre at The Woodlands campus of Lone Star College, right here in Montgomery County, Texas. There was magic on that stage last Sunday, and I was blessed to be a part of the audience that witnessed it. The story of Mulan, for those not acquainted with the Disney animated film, revolves about a young girl by that name in ancient China. Starring brilliantly in that lead role was young Emily Hammer, whose sweet voice would be on full display in such charming songs as, “Reflection.” Mulan’s mother (Sabra Leong) and Grandmother (Katherine Barlow) hope to find her a husband via the ornery village Matchmaker (Gabi Lechtig-Martinez). But the plot finds the Huns invading China and the Emperor (Drew Gerlach) has demanded that one male member of each family must join the army to fight the invaders. Chi Fu (Zachary Pratt) is the cruel Chinese bureaucrat, who comes to execute that order in Mulan’s village, but Mulan’s father, Fa Shu (Jesse Bates) is the only male in her family and he is old and ailing. To protect him Mulan undertakes to disguise herself as a boy so she can fight in his place. But more significant than the story line is the exquisite detail that director, Tina Kraft, has brought to her realization of the tale for the stage. Amid the perfectly synchronized soundtrack of haunting music from the Far East (Musical Director, Rae Moses), the curtain rises on dramatic blood-red lighting (Blake Minor, designer) and the loveliest entrance procession of Oriental children since The King & I, all dressed in the exquisite Chinese costume designs of Caroline Zirilli. And that was just the beginning. The lovely triangulated set design of Kent Hale easily rotated scenes from rugged mountains to cherry blossomed gardens, and could have perfectly decorated the most elegant Chinese restaurant. But the food we had from this production was food for the soul, with its rich expression of ancient traditions and the values of respect, honor, and strong devoted families. It seemed in many ways an instructive lesson for our time that had traveled across the ages. 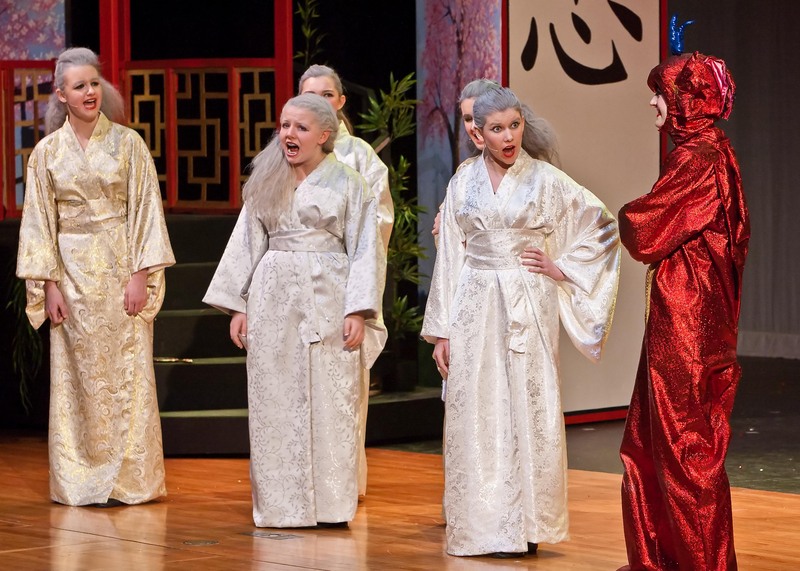 A chorus of five ancient “Ancestors” (Kamryn Mattingly, Kristin Wight, Julie Lewis, Shelby Thompson and Katherine Turner) presides above the stage and guides us on this musical journey. And what lovely music it is, with such charming songs as, “Honor to Us All,” and “Written in Stone.” This cast performed all the songs with a musical purity that perfectly echoed the cultural purity of the play. Better still, the songs were most often accompanied by the exquisite dance designs of choreographer, Clay Moore, that were beautifully executed by this large and very talented cast. The Ancestors allow a special little dragon named Mushu (scene-stealer, Devin Cherry) to prove his worth by accompanying Mulan and keeping her safe during her adventures. Miss Cherry is a delightful “ham” and brought considerable hilarity to the proceedings with her comical performance as the dragon. She is every inch the sassy showstopper leading the cast in the delightful, “Keep ‘Em Guessing.” She lights up the stage, and I hope we will see more of her in future productions. During her military adventures Mulan is under the command of handsome Captain Shang (Grayson Higginbotham), while the Hun invaders are led by the ruthless Shan-Yu (Jesse Bates). Mulan and her fellow soldiers perform the fun-filled, “A Girl Worth Fighting For,” and Mulan cleverly causes an avalanche that seems at first to have buried the Hun enemies. Director Kraft brilliantly conceived that avalanche scene here, with a dramatic rush to the stage of snowflake dancers appearing through the audience, while snow-like sheets covered the Huns. It was beautifully done, and reminded me of the highly stylized performances I saw from Kabuki Theatre in Tokyo during a trip to Japan. 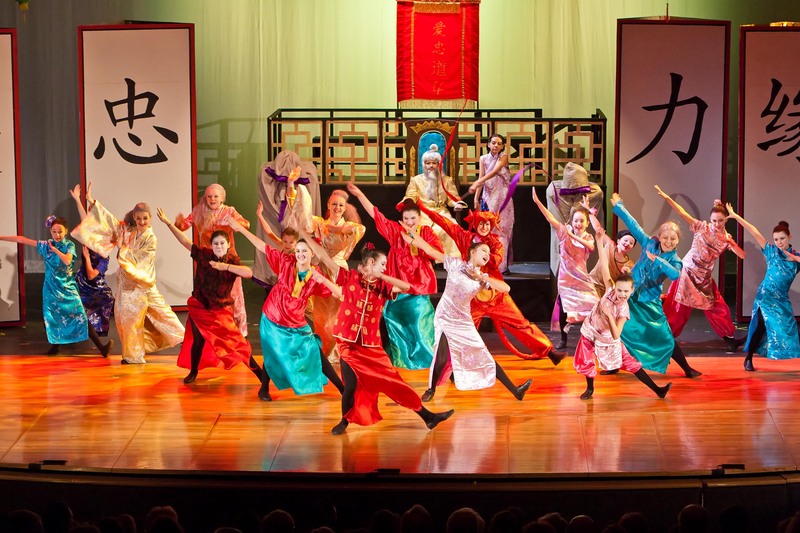 The Hun defeat was then celebrated with a colorful and joyfully staged “Dragon Dance,” featuring ribbon dancers and lively choreography from the full cast. 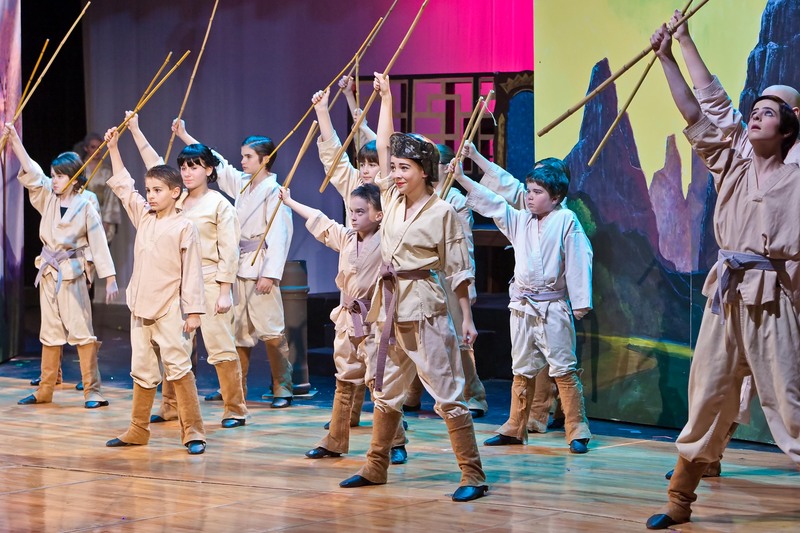 It wouldn’t be long before the whole theatre erupted in joy as the cast dazzled us once more with a finale of the popular song, “Kung Fu Fighting.” A young child seated behind me was squealing with delight, and if we adults had any sense we would have done the same. I am reminded of one line in the show where Mulan is told, “You have brought honor to us all.” That, in my opinion, is what Class Act Productions and producer Keith Brumfield have done for this community. 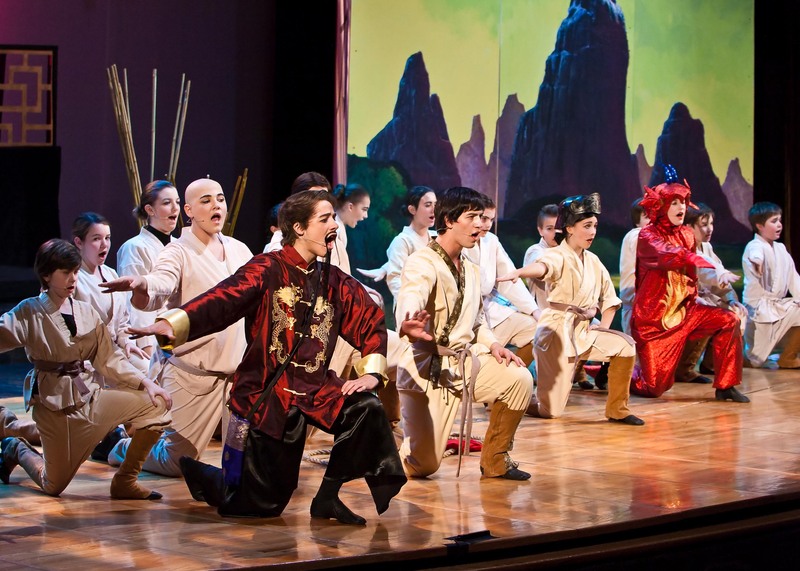 MULAN has music & lyrics by Matthew Wilder, David Zippel, Stephen Schwartz, Jeanine Tesori, and Alexa Junge. Music was adapted and arranged with additional music & lyrics by Bryan Louiselle. The book was adapted with additional lyrics by Patricia Cotter. 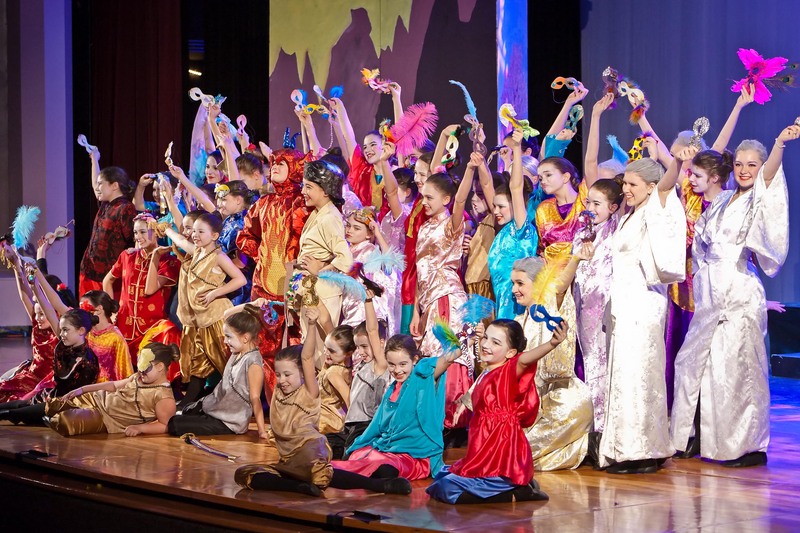 This production was based on the 1998 Disney film, MULAN, and on the book, “Fa Mulan” by Robert D. San Souci. This entry was posted in BroadwayStars.com, Miscellaneous Reviews, Movie Reviews, Theater Reviews, ThePeoplesCritic.com and tagged Class Act Productions, Entertainment, Mulan, music, musicals, plays, Reviews, Texas, theatre. Bookmark the permalink.